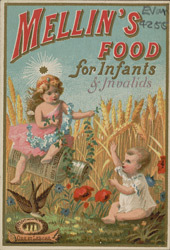 This is an advert for Mellin's food for infants & invalids. Artificial food for children and infants became available when Justus von Liebig advertised his ‘perfect’ infant food in 1867. The first mixture was of wheat flour, cow’s milk and bicarbonate of potash. It was initially sold as a powder and later was available as a liquid. Soon other manufacturers like Mellin’s, Nestle's and Horlick's started to produce their own food. Mellin's was made with desiccated malt extract.